Apple debuts iTunes Pass in Japan, allows Passbook-based iTunes credit refills at Apple Stores. Use the iTunes Pass, you can now deposit directly to the account of the App Store or iTunes Store you. Go to the iTunes Store in the iOS device you have, if you tap “Use iTunes Card / Code” button and scroll down, you can get the iTunes Pass. 3 Please tell specialist that then, the Apple Store near you, you want to deposit into account. When you open the iTunes Pass from the Passbook, specialists will scan it, and accepts the payment. Balance is updated on the fly, available immediately. This move by Apple is significant in multiple ways, including for paper conservation and the future of mobile payments. The ability for Apple to add iTunes credit to user accounts via a quick scan of a Passbook pass will likely reduce the amount of physical materials needed to produce gift cards. 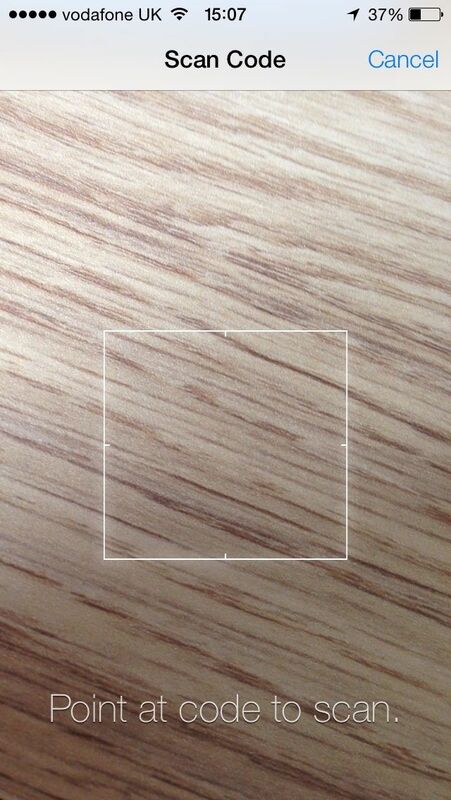 Second, this feature could be a hint at Apple’s mobile payments plan. Sources previously told usthat Apple is readying an iTunes-based mobile payments service that would integrate with Touch ID and Passbook. Apple Stores rolling out the ability to apply credits to iTunes accounts could be the first practice run for such functionality. While the feature is launching in Japan today, Apple has not yet indicated if the function is planned to come to other countries in the future. Apple rarely launches significant initiatives in just a single region outside of the United States, so perhaps a larger rollout with more countries is not far behind. Another possibility is that Apple is using Japan as a test country for this feature as the region is a major market for Apple, but one with only nine Apple retail stores. Apple has approximately 400 other locations outside of Japan. 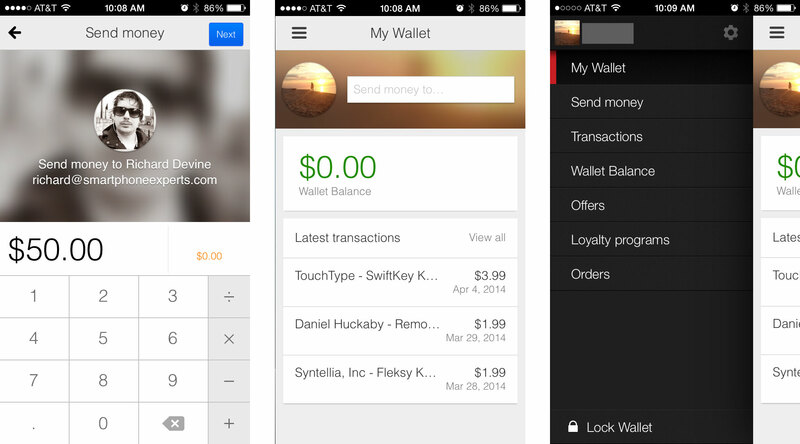 Best payment and wallet apps for iPhone: Square Wallet, PayPal, Passbook, and more! 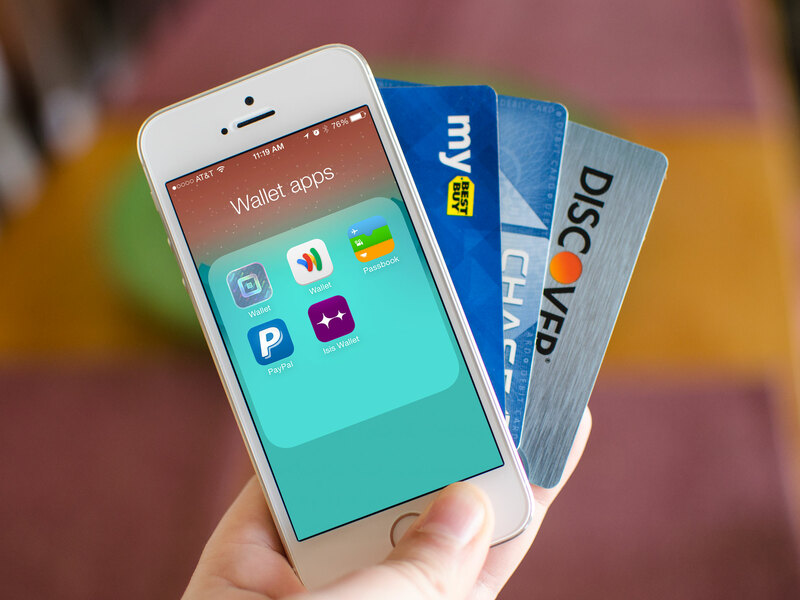 Looking for the best iPhone apps to pay with at your favorite stores? The ones that will let you make your wallet digital? The App Store offers all kinds of payment solutions for iPhone. Whether you’re buying online or going to a good old-fashioned brick-and-mortar, there are a ton of apps to choose from. But wish payment and wallet apps are the very best? Square Wallet lets you link a debit or credit card to your Square account and pay with it anywhere Square payments are accepted. If someone sends you a Square gift card you can also store that inside the Square Wallet app for use whenever you’re at that merchant. For some places of business, you can even choose items from inventory and have your sale ready before even getting to the cash register. Square merchants can then see you’re using Square Wallet from the Square Register app and simply tap to confirm your payment. If a lot of merchants in your area use Square, you can’t go wrong with Square Wallet. Google Wallet, currently available for purchases in the United States, lets you save all your loyalty cards in once place. You can also make payments online and at any merchant that has a card with credit attached to it. If you need to send money to someone, you can do so for free as long as they’re using Google Wallet as well. Google Wallet offers tap to pay for NFC-enabled devices but as the iPhone doesn’t have NFC, tap to pay isn’t something Google Wallet supports for iOS… yet. If you make a lot of digital payments or are tied into Google’s services already, Google Wallet is a great option. PayPal is one of the most accepted payment services on the planet. Lots of physical merchants can also let you pay with PayPal, no actual credit card needed. 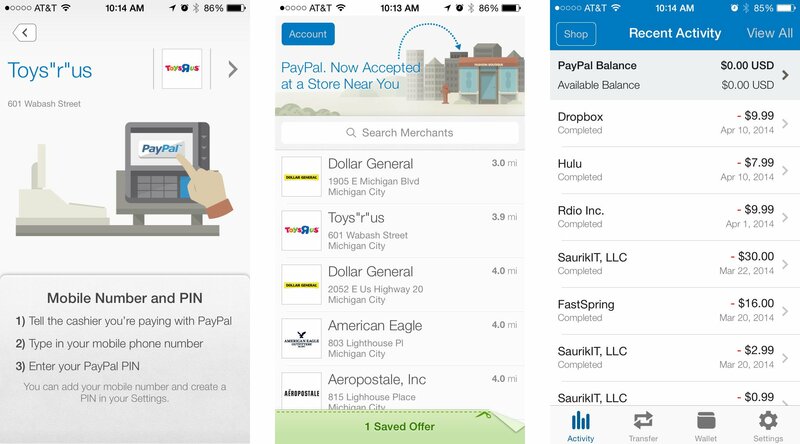 The PayPal app can use your location to determine what merchants around you let you pay with PayPal. Once you’re at the checkout, just tell them you’re paying with PayPal instead of cash or a card. You’ll just have to enter your mobile number and PIN and you’re good to go. PayPal just deducts the funds from whatever bank account or credit card you have linked. If you already use PayPal as your payment service of choice, check out what merchants support payments with PayPal in your area. 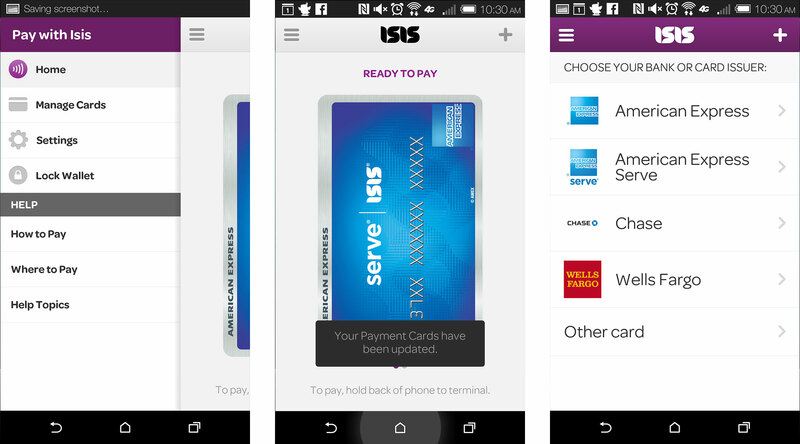 Isis is available to both AT&T and Verizon customers and offers the same tap to pay functionality Android users currently enjoy with NFC. The only catch? You’ll need to buy an accessory case to make Isis work. After that you can add all your payment cards, including American Express Serve and Chase bank cards, and start tapping to pay at literally thousands of merchants with tap to pay terminals. If you don’t mind buying a case in order to get the same tap to pay treatment Android customers already enjoy, get Isis Mobile Wallet. Last but definitely not least, lots of merchants have deployed their own payments cards that are integrated through Passbook. Just add the card within the merchant’s app with support for Passbook and you’re good to go. Whenever you’re within the vicinity of a merchant you have stored in Passbook, your pass should appear on your Lock screen for easy access. 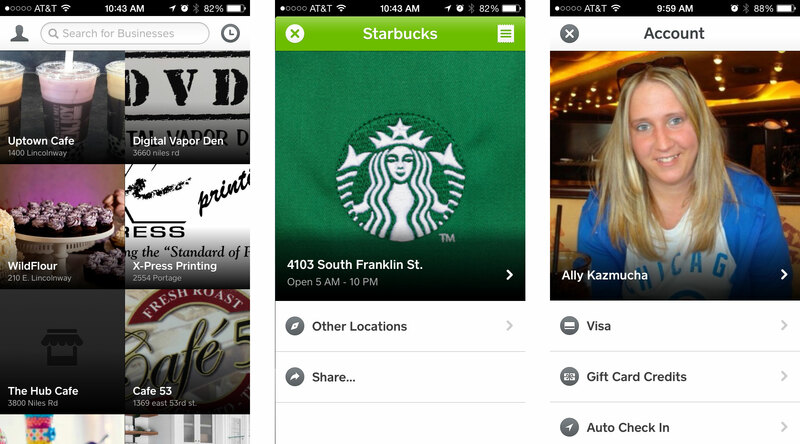 Popular merchants such as Starbucks have deployed Passbook payments worldwide. easyJet expands Passbook support to 75 airports. In May, popular European discount airline easyJet announced that it wastesting Passbook ticketing support at six airports in Europe, with support to come from more airports if the trial was found successful. And judging by today’s easyJet app update, it looks like that’s the case. Now the company is offering Passbook ticketing support at a whopping 75 airports in Europe. This is significant because easyJet is one of the most popular discount airlines. Passbook-supported apps have been slow to catch on outside of the US (and even inside the US). easyJet is a free download. 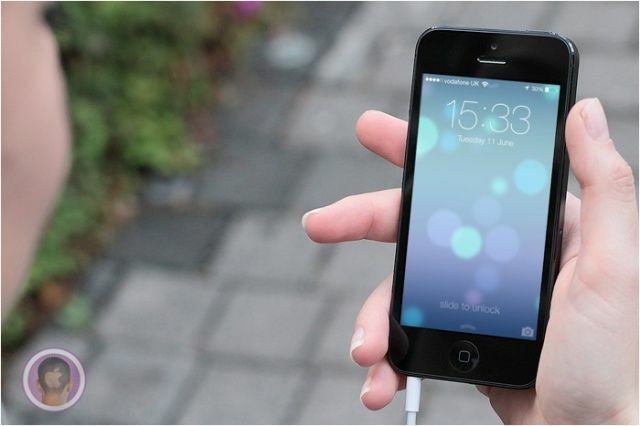 10 Awesome iOS 7 Features That Apple Didn’t Mention. I’ve given iOS 7 a lot of hate — just because I hate its icons — so I thought it was about time I showed it some love. It may not look the best, but the next-generation of iOS is packed full of awesome new features that should greatly improve the user experience. A lot of those were detailed during Apple’s keynote at WWDCy, but some got left out. So here’s ten awesome features in iOS 7 that didn’t get a mention at the event. Finally! This is a great addition to iOS 7. With Notification Sync, you’ll no longer have to trawl through the same notifications on several iOS devices, because once you’ve read them on your iPhone, they’ll automatically be marked as read on your iPad — and vice versa. 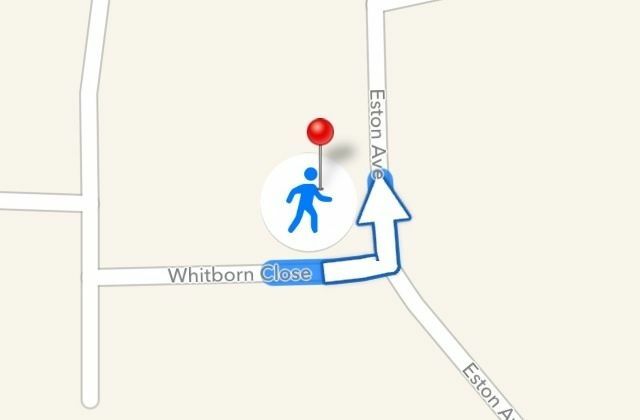 Maps doesn’t just provide you with voice-guided turn-by-turn navigation in the car now, but also when you’re on foot. Just select the walking directions icon when planning a route. Turn-by-turn walking directions aren’t the only improvement in Maps, either. 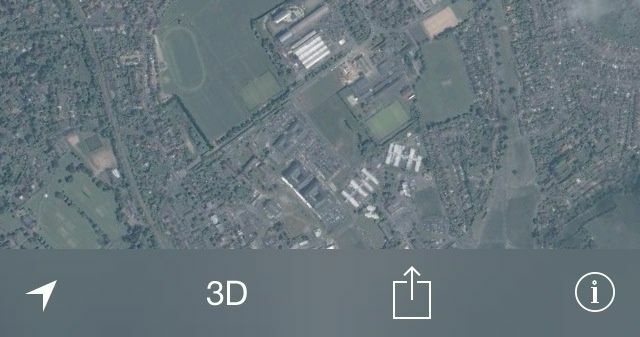 Apple has also added a new Night Mode, which will mean Maps is easier on your eyes when you’re driving in the dark. What’s more, it’s automatic, so when your iPhone recognizes it’s night time, it’ll load the darker theme all by itself. 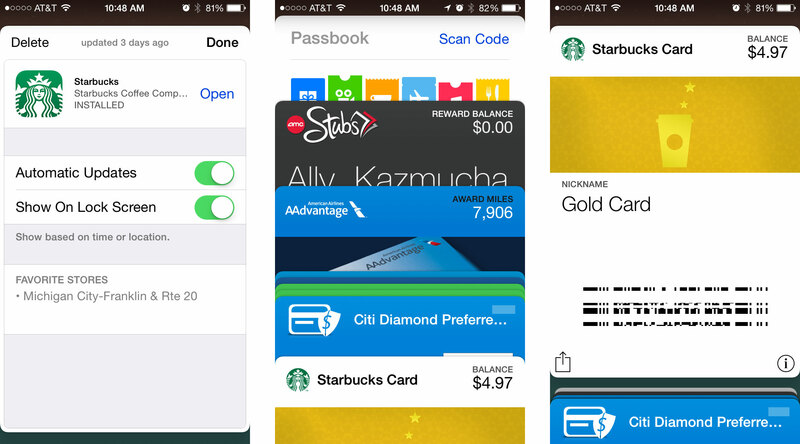 You can now scan QR codes to quickly add digital cards, passes, and coupons to Passbook. FaceTime doesn’t just support video calling anymore, but also good old voice calls, too. This is great if you’re out of the country and you want to make free calls over Wi-Fi, but you don’t want anyone to see your ugly, sunburnt face. 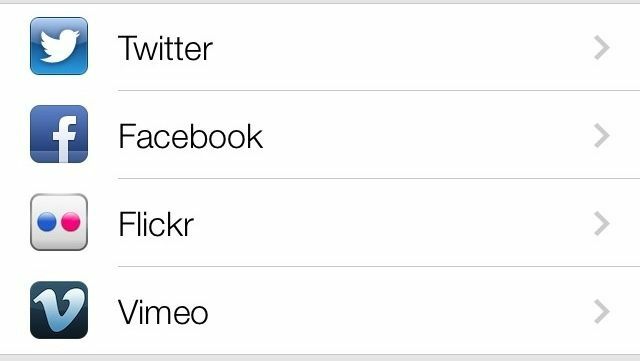 Facebook and Twitter integration has been joined by Flickr and Vimeo in iOS 7. You can sign into your Flickr and Vimeo account inside the Settings app, and then it’s super quick and easy to upload photos and videos from from your camera roll and albums. 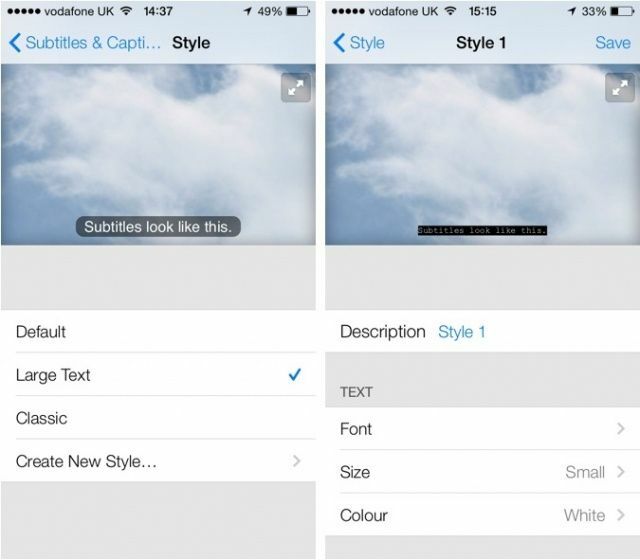 You can now customize the subtitles shown in supported movies and TV shows within the accessibility settings. Apple provides three default options, but if you want to, you can create your own, picking your own font, its size, and its color. Spotlight no longer has its own page on your home screen. Instead, you simply swipe down on any home screen to access the search box. Don’t swipe down from the top or you’ll just get Notification Center — try swiping down from the center of the display instead. In iOS 7, your device can use its built-in sensors to provide you with an inclinometer, which is why the new Compass app has a level built in. Inside your Photos app, there’s a new “Activity” stream under the “Shared” section that provides you with updates on all your photos. You can see how many images you’ve taken today, who’s added photos to your shared Photo Streams, and who’s left comments or likes. In addition to this, you can now upload images and videos to shared Photo Streams that you’ve been invited to. American Airlines iOS app adds departures, gate & seat changes on lock screen for Passbook boarding passes. American Airlines updated its app for iPhone and iPad today bringing an enhanced Passbook experience for digital boarding passes, improvements for AAdvantage account holders, and the ability to chat with the airline’s Twitter team. Perhaps the most notable update, and something British Airways announced it will be adding soon to its recently announced Passbook support, is the ability to view updates about departure times, gate and seat changes directly from your iOS device’s lock screen. The updates will appear after you’ve added your boarding pass to Passbook. iTunes Festival London 2013 app gets Passbook support. You can get the app for free here: iTunes Festival London 2013. British Airways adds Passbook ticketing support. The airline expects to enhance Passbook boarding passes by adding direct links to the iPhone’s lock screen by mid-June. Passbook has seen modest success in the United States and support has been slow to catch on in Europe. But things seem to be improving on this side of the pond as the addition of Passbook support from British Airways comes just five weeks after easyJet, the number one European airline by passengers carried, added support for Passbook. British Airways is a free download.